You have just received notice that you are about to be evicted, and you have no idea of your legal options, but you heard on the radio that legal help is available at your local community center. Members of the winning Rapid Response Legal Support team with panelists and judges, from right: James J. Sandman, president of the Legal Services Corporation; David Biemesderfer, President and CEO, Florida Philanthropic Network; and Lisa Portelli, program director, Winter Park Health Foundation. While there is no lawyer on site, a law student volunteer at the community center can scan your lease, the eviction notice and your correspondence with the landlord, help you complete a quick online application, and e-mail the documents to an on-call volunteer attorney. Right then and there you can connect via Skype with the attorney, who can walk you through the steps to buy yourself some time so you and your children won’t end up on the street or at a homeless shelter. 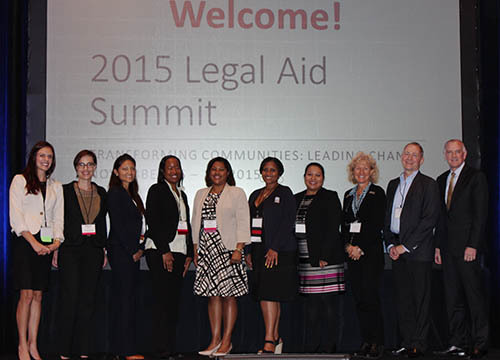 Such is the vision of a small group of legal aid attorneys and staff who spent two and a half days devising Rapid Response Legal Support, the winning legal design project at the Florida Bar Foundation-hosted Legal Aid Summit Nov. 16-18 in Orlando. The summit was supported with a portion of the funds from a $500,000 cy pres award directed to the Foundation through the efforts of Tampa attorney John Yanchunis of Morgan & Morgan Complex Litigation Group. More than two dozen teams made up of five to seven legal aid personnel from organizations throughout the state each designed, prototyped, tested and refined a solution to a legal services problem. Providing guidance was lead facilitator Margaret Hagan, a fellow at Stanford Law’s Center on the Legal Profession and a lecturer at the Stanford Institute of Design (the d.school) who had worked on planning the summit along with a design team made up of legal aid and Florida Bar Foundation staff and consultants. Lead facilitator Margaret Hagan, center, meets with members of the Legal Aid Summit design team at the end of the first day. Each small group worked on a solution to one of five challenge questions: How do we tap new and varied resources to support our work? How do we develop and retain a new generation of leaders? How do we use data to enhance our resources, our work and our impact? How do we serve our communities in more client-centered and strategic ways? How can we collaborate more inside of our legal services network and beyond? Hagan coached and walked them through a series of design stages that included brainstorming, prototyping, testing, pitching and debriefing. 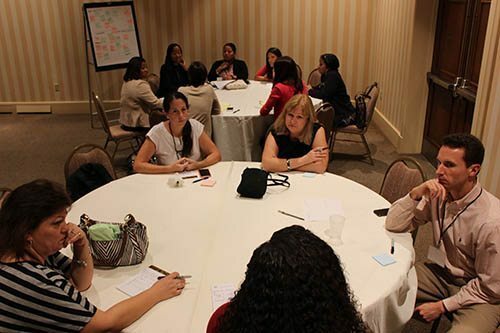 Several guest speakers from around the country worked with the small groups during 30-minute sessions for each stage. Each challenge area had multiple teams, and at the end of the second day the teams in each area voted to determine which team from among their ranks would represent their challenge area in the finals. The finalists then pitched their ideas to a panel of experts and funders. The panelists were David Biemesderfer, president and CEO of the Florida Philanthropic Network, Lisa Portelli, program director at the Winter Park Health Foundation, J. Kim Wright, CEO of Cutting Edge Law, and James J. Sandman, president of the federally-funded Legal Services Corporation, now the largest funder of civil legal services in Florida. Sandman said the test of any conference is not what happens at it, but what happens afterwards. 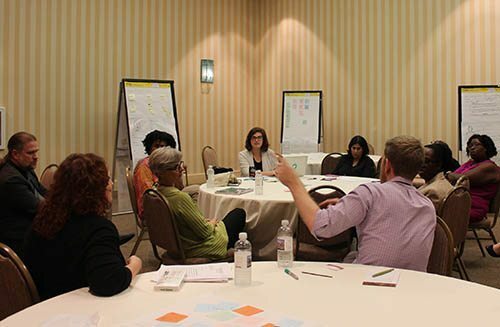 Participants clearly have made that their intent, and the Foundation will continue to work with Hagan to help bring some of the ideas spawned at the conference to fruition and to inculcate creative problem-solving processes and cross-institutional collaboration throughout the Florida legal aid system. Amy Burns, deputy director of Florida Rural Legal Services, headquartered in Ft. Myers, said conference was “incredible” and that the energy and enthusiasm that it generated will reap big dividends. Team members work on their presentations at the Legal Aid Summit’s tech station. Anais Bimonte, 27, one of the young attorneys of whom Burns was speaking, said she would like to take the legal design concepts she learned back to Florida Rural Legal Services and use them with pro bono attorneys. “I am actually impressed with the product that has come out. 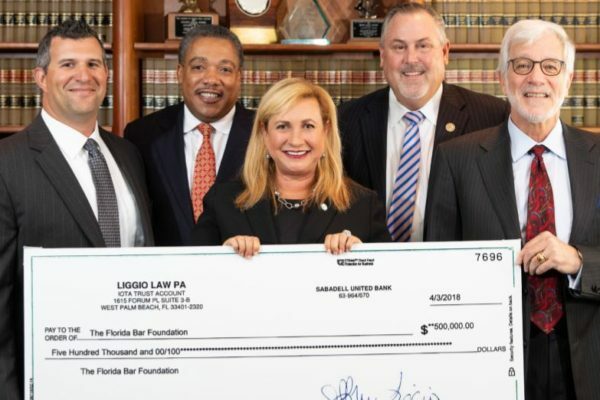 It definitely makes you look at our system very differently, and the fact that The Florida Bar Foundation is supporting this is amazing,” Bimonte said. Eli Mattern, a staff attorney at Brevard County Legal Aid, said involving people from all levels of the organizations and working in interagency teams provided an unprecedented networking opportunity. Among the 163 team members were executive directors, attorneys and paralegals, as well as information technology, development, pro bono and support staff. “I felt like we really got to connect and get to know people from other organizations in a more substantive way than I have at any other conference to date,” said Mattern, who is also a principal in a legal tech start-up company. She felt that the exposure to design thinking will make it easier to get buy-in from others in her organization for approaching problems through a design process. Online voting allowed people around the country to select a winner from the projects that didn’t make the finals. The winner of that competition was Mobile Justice, an app that would provide legal information through videos in multiple languages, so that even non-literate users and non-English speakers could have access to legal information. “There would be topics listed, but there would be auditory prompts as well, and from there they would get the information they would need,” explained Guerby Noel of Legal Services of Greater Miami, a member of the Mobile Justice Design team. Janis Mason, pro bono referral assistant with the Legal Aid Society of the Orange County Bar Association, was a member of the winning Rapid Response Legal Support team. Mason portrayed the client in a role play that was part of her team’s pitch. She thought the variety of perspectives among the participants was a major plus. “It showed me something different. It let me into someone else’s world,” she said. Sandman delivered the closing remarks at the summit. He had high praise for the work going on in Florida to expand access to civil justice, and in particular the success of the Florida Commission on Access to Civil Justice. Teams went through a series of design, prototyping and testing stages to refine their ideas. Furthermore, Sandman said, the report comes from people in a position to do something about the problem. Sandman said when looking for funding and support, it’s important to get the message out beyond the legal services world because many philanthropies don’t understand that legal aid addresses the issues they have identified as their priorities – issues such as homelessness and domestic violence and poverty in general. “To me it’s something that really needs to be heard. I think among my membership that needs to be understood better,” said Biemesderfer, who heads a statewide association of nearly 120 philanthropic organizations that incluce private independent, corporate and family foundations, community foundations, public charity grantmakers and corporate giving programs. “I was just really struck by the passion of all the people here of wanting to make a difference,” he said. Vivian Chavez, Legal Services of Greater Miami, Inc.
Greg Bloom, Open Referral Initiative and affiliate of Code for America, leading the movement for social and legal services groups to standardize their data and build more coordinated services. Dorcas Gilmore, visiting practitioner in residence in the Community and Economic Development Law Clinic at American University and former assistant general counsel for the NAACP. Kursat Orsenc, senior user experience designer, Autodesk. Former design researcher for Yahoo and Microsoft. Orsenc also lectures, teaches and does research in interaction and participatory design for Stanford University. Purvi Shah, director of the Bertha Justice Training Institute at the Center for Constitutional Rights. Through the Institute, Purvi helps lawyers develop a deeper understanding of the connections between law and social change. Gretchen Slusser, executive director Cabrini Green Legal Aid, Chicago, which provides both civil and criminal defense legal services, combined with social work support. Michele Storms, dean of students, University of Washington Law School, and former Washington legal aid director.